Replies: 72 (Who? ), Viewed: 31136 times. Sorry for maybe a stupid question. I tried to follow this, however I am a bit lost on how exactly the branches work. 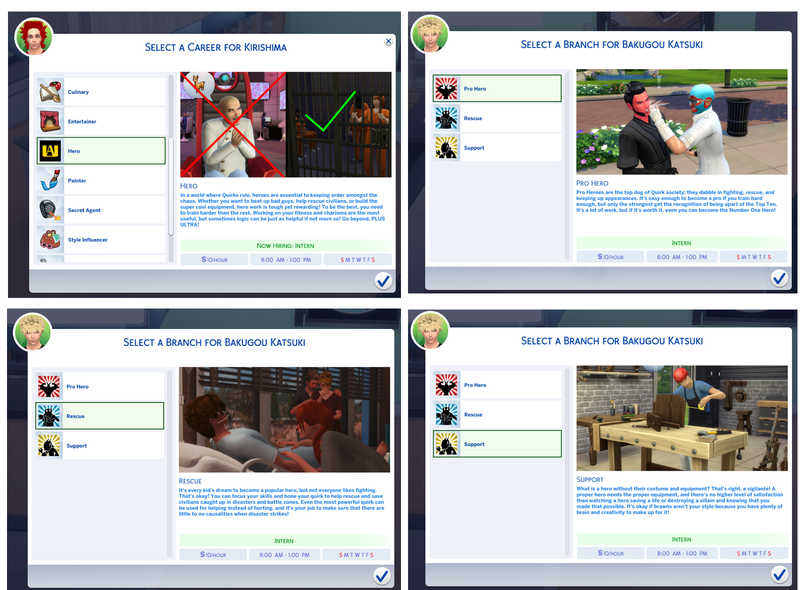 Correct me if I am wrong, I was under the impression that you could make something like.. 7 levels in the main branch, and then add different career paths/branches with other 3 levels each for the sims to further continue their climbing of the ladder. So basically there's an extra level in between lvl 1 and 2 which is not reflected in the stuff I see in the tool. I don't see that level anywhere, and it looks like it's linked to the branches? I cheated my way up to lvl 7 and after that I can pick a branch normally and continue which is great. But that "ghost branch" career lvl between 1 and 2 haunts me, lol. What can I check to remove it? There are no stupid questions! Trust me, sometimes it only takes a second set of eyes to see something we may have missed. 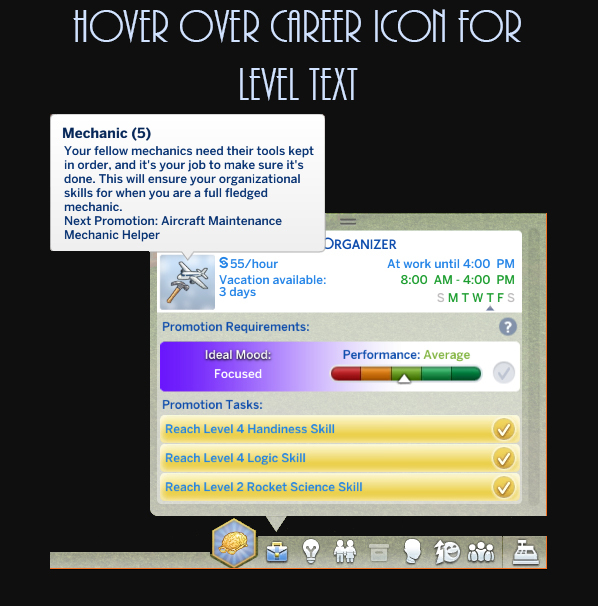 Did you change any of the levels by removing them during the creation of your career in the tool? That can sometimes cause issues. Another possible cause could be if you've used characters other than letters and standard punctuation in your level title or description. And to be sure, check that you've got the ts4script file installed that you created using the .py file that was exported with your career. I've seen problems like this when people don't have it, or haven't created it correctly, even though it's only supposed to be for the Paid Time Off function. My thoughts are there's a possible conflict with another mod somehow, or maybe adding child as a potential job user is the culprit, and may conflict with a possible required skill you've included that children and/or teens can't develop and require cheating through the levels. Another thing is to double check the format you've used to add child and teen to your XML. Careers automatically come out of the tool being available for young adult/adult/elders, so you have to be careful when adding other ages, making sure all age references are altered, wherever they exist in any of your XML. I would recommend recreating the career from scratch (you should be able to copy and paste into the fields), and testing it before you add child/teen to the mix. Keep an unaltered version saved to go back to as you try to make it available for the other ages. Also, be sure not to use characters other than letters in your job level descriptions and titles, if you have, as that can cause problems. Did you create a mod for swimming classes? I'm asking because I'm concerned that there may be a conflict. Does this problem occur with any other careers, either from the game or custom? Unfortunately, though, I won't be able to help on this issue because it will be technical, either way. I recommend you bring this up with Neia on the Create-a-Career forum thread. Can anyone confirm if the level descriptions actually show up anywhere in game? I'm making a career with 12-14 branches, each will have 4-6 levels. So I don't want to spend months writing level descriptions if they don't show up in-game. Just wanted to that this thread helped so much! I was able to make a 3 tier Hero career for my My Hero Academia mods I'm making. If I can figure out how to make chance cards I'd be thrilled, so if anyone has a link or any info that'd be appreciated. Only problem is that if you quit or get fired, you don't have the option to choose a different Hero path if you want to apply again, not sure I can fix that though. Chance cards have been made by a couple of people out there on the web, but none have as yet been uploaded to MTS. 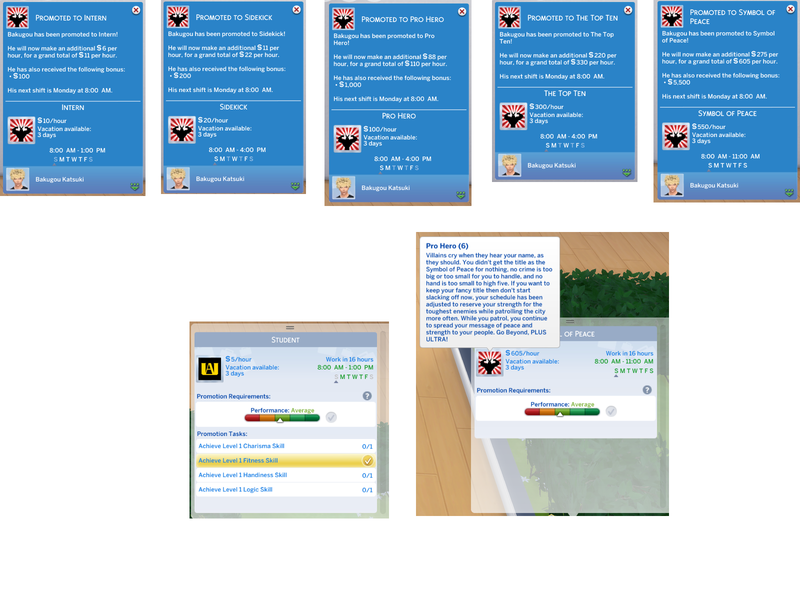 If you go into Sims4Studio's extraction tool, you can find the chance cards that are provided by the game. Modifying them to fit your career is complicated, but we know it can be done. We don't have any tutorials on here, and I don't know of any offsite either, sorry! I've looked at trying my hand at them, too, because it would be awesome, but I'm put off by the time involved in getting it done right, without knowing exactly what I'm doing You can certainly give it shot, though! Careers are like that. Once you pick a track, it doesn't seem to want to let you back into the beginning after quitting or getting fired. I'm not sure if that's a game flaw or what. Possibly something to ask Neia on the Create-a-Career forum, or perhaps see if it happens on a Maxis career as well. Thanks! Yea I've seen some things here and there about cards, but nothing specific. I'll probably just continue with costume mods. Now I need to see if i can make customizable work uniforms! This message has been deleted by Camavani. Reason: I already found the answer! This message has been deleted by Sims_Lover. This message has been deleted by Sims_Lover. Reason: I figured it out. okay figured it out. you have it written don to place in python file, but it goes in the python-lib folder. anyways. now if i make multiply careers do i need to place mulltiple nieie career common packages if they give them to me in the export? You only ever need one Careers_Common.package in your Mods folder, so make sure you have the latest one relative to your Game Version. Each time you export a career from the tool, you'll usually get that file because it can't distinguish if you already have it from a previously exported career. 1-No Careers_Commons.package file required as the career only uses the Base game skills. 2-Yes Careers_Commons.package file required and you can include it in the .zip that you upload. now I'm off to see about any new updates...thank you for your questions! Last edited by Simmiller : 11th Apr 2019 at 2:31 AM. im having a real issue. everything in game works. i did a career with 4 branches. the first thing that pops up when you first get the career, the title is blank?! but its showing 15$ and hour and objectivs. ive triple checked everything and its stll blank. and there is no reason it should be. but when promoted its not blank and everything works fine. anyone know whats going on with the career creator tool. is it getting updated? hi guys sorry if this has been answered but i cant seem to find an answer anywhere i have installed two mod careers but there is no description while i go to choose career am i doing something wrong or has the update messed things up? Yes, it's most likely the update causing issues. Neia's really good about updating the tool, so once that happens, creators will have to update their careers again and then they should work. Thanks for your patience everyone! The latest patch broke custom text, but there's a workaround that can be used until the next patch.